A former Maryland judge who ordered the defendant to be physically tasered in his courtroom was sentenced Thursday to participate in anger management classes and pay a $5000 fine. On Nalley’s order, the Charles County Sheriff’s Department officer pushed a button that administered an electric shock to Delvon King, 25, who is not a lawyer, but represented himself against gun charges. 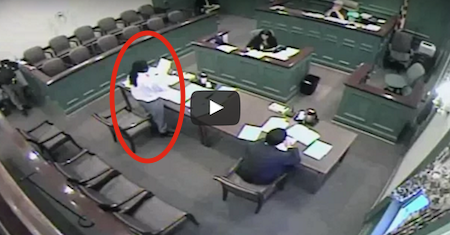 After he was shocked, the defendant fell to the ground screaming. A video of the exchange without sound and separate audio was played in court Thursday. You Won’t Believe What This Drone Caught These Dolphins Doing On Camera!